Bread has long been called the staff of life. It is mentioned over 300 times in the Bible. One of the main ingredients in bread is wheat. But is the wheat we eat today the same as wheat of ancient times? NO! Modern wheat is not even close to the wheat of ancient times. The original wheat of Bible times had been identified as Triticum monococcum and is more commonly called Einkorn. It is a wild diploid grass that has 14 chromosomes. Modern hybrid wheat has undergone rapid and significant changes. It is now a hexiploid grain that has 42 chromosomes. Interestingly, humans have 46 chromosomes. So you see, there is a huge difference between the original ancient grain and the man-made wheat that is cultivated and used today. Hybrid wheat was developed to accommodate modern agricultural practices. In ancient times, the wheat was cut and stacked in bunches while still green. The hulls remained intact protecting the nutrients while the grain matured and was milled. Today, the wheat ripens before it is threshed in the field as it is harvested. The enzymes never develop as they do when the ancient harvesting practices are followed. As a result of all these changes, more and more people are developing gluten sensitivities. The digestive system simply is not able to adequately handle these modern hybrids. Gluten-free foods are quite common in grocery stores. But does this solve the problem? Not really. Gluten-free products are actually quite fattening, so many people who have followed a gluten-free diet are now discovering they have a hard time controlling their weight. I have been following a gluten-free diet for many years. I ended up in the ER with anaphylactic shock once after eating wheat unawares. So when Young Living introduced some new products made with Einkorn, I was cautious about trying them. Gary Young shared some tips for people like me. He said to eat just one or two bites the first day, and gradually increase the number of bites as tolerated over several days or weeks. I did that and also discovered that it made a huge difference to take enzymes when I ate the Einkorn. 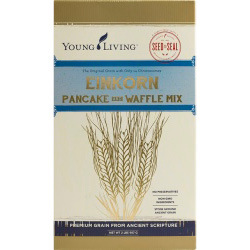 Now I am able to eat a small amount of the Einkorn Pancakes without any discomfort. I do have to tell you that these pancakes are the tastiest pancakes I have ever eaten! I still cannot tolerate hybrid wheat, however. If you want to read more about wheat and gluten intolerance, I recommend the book “Wheat Belly” by William Davis, MD. And check out the new Einkorn products available from Young Living Essential Oils! 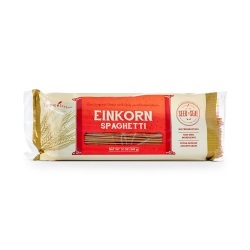 I also suggest you watch this one-minute video clip about Einkorn. Click here to watch. I am confident you will be pleasantly surprised.